When I attended the Fitness and Health Bloggers Conference in Boulder in May I had the chance to meet some pretty amazing people. Some of those people were bloggers, some of those people were business owners or marketing employees. And one of those people was named Jim. Jim is the eCommerce Marketing Manager for Big Train products and we talked about the company while I sampled products. Somewhere along the line we swapped business cards and now I’m the proud owner of 5 (…um, now 3. Vanilla Latte and Espresso were tasted.) 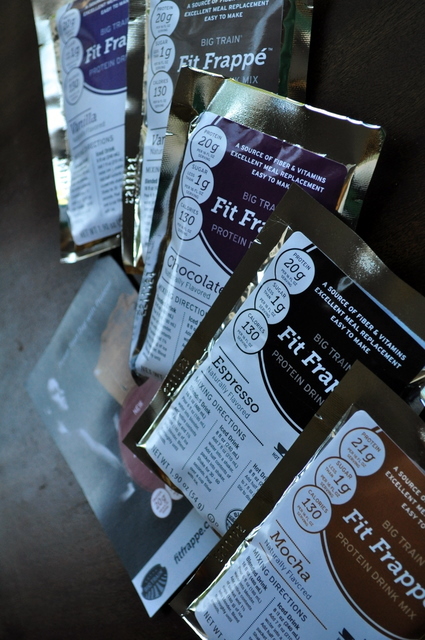 of Big Train’s newest and just-launched product, Fit Frappe. Jim was nice enough to send me some sample of the newest product to try. And I’m pretty happy about trying these guy’s out. Well, I’d be even more excited if I had tried all of them before my cleanse. I tried two but that’s enough for a review, right? 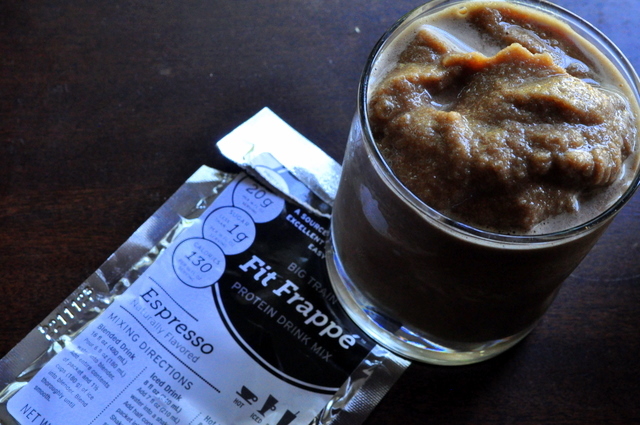 For your Fit Frappe in a glass, simply add a little water, a Fit Frappe packet, and ice to a blender. 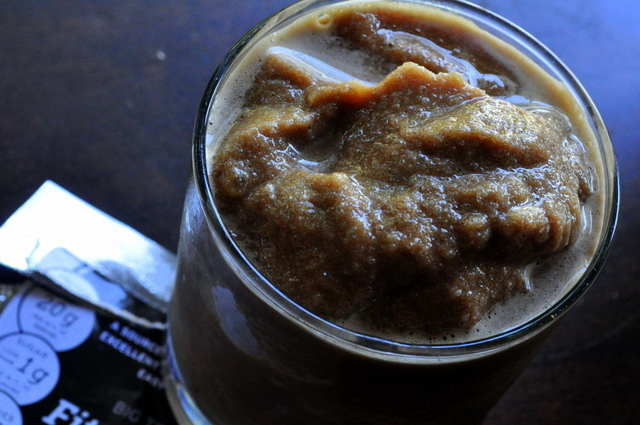 Blend and you’ve got yourself an icy blended coffee drink, no Starbuck’s included. The consistency of these drinks was perfect. I am a fan of blended and icy coffee drinks so a perk is I can add as much or as little ice as I want. The taste is pretty good, too. This does not taste bitter or overly sweet, or chalky from the extra protein. It has a slight hit of fake-sugar taste, probably from the sugar substitutes used but overall it’s a winner. Unfortunately, this product is not dairy free, so while I did enjoy some spoonfuls of the blended drink, these were made and given to my mom to enjoy. She said they were the perfect substitue for the blended Java Retreat or Starbucks drinks she buys and with a little cinnamon powder blended in, maybe better. Especially because they have way more nutritonal benefits than the latter. ****Big Train, Inc. is a beverage company who distributes products for wholesalers, retailers, and coffee houses. I was told these were so new that there not even in stores yet! BUT consumers can purchase a 5-Pack Sampler Kit or larger jugs of each flavor on their Facebook Store: http://www.facebook.com/bigtrain. Just look for the shop now link– free shipping with any order! 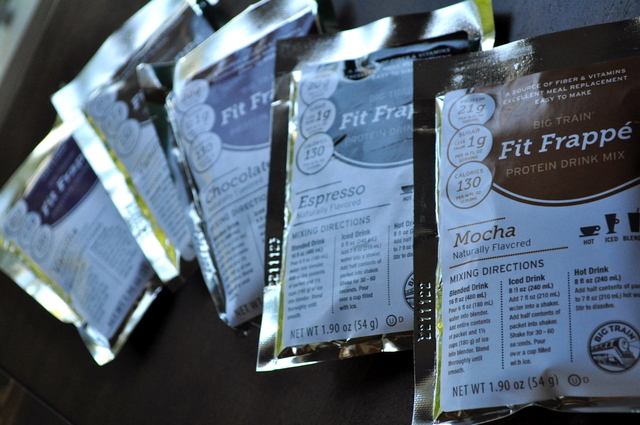 FitFrappe.com also has links to this store and more details. Don’t forget to go on their website and take a look at all the fun mixes they have, including some awesome chai drinks, smoothie add-ins, Asian-inspired drinks, frozen hot chocolates, and more. There’s even recipes that look pretty darn tasty. Have you ever heard of Big Train? Try finding their products in your favorite local coffee house! Blended, iced, or hot? How do you like your coffee drink? Blended is my favorite… but then again, I am slightly addicted to icy smoothies. 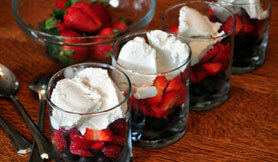 Ohh those look pretty darn good! Looks gooood, I love ice coffee smoothies. Will try it the first chance I’ll have. Wow I want one of those smoothies right now. It looks so refreshing and delicious! Thanks for the Love Lori! 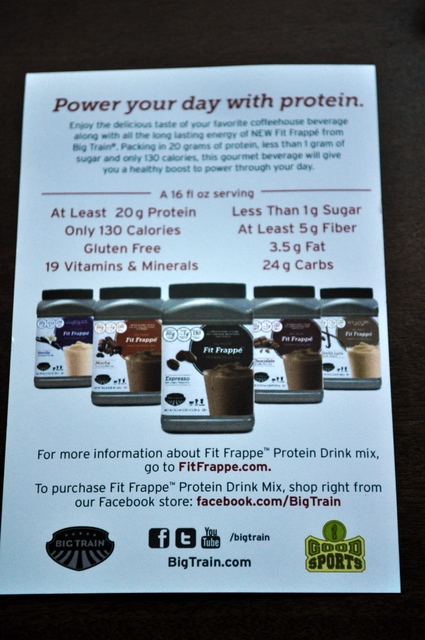 Fit Frappe drinks can be served hot as well in fact I’ve replaced my fat high-sugar creamer with Fit Frappe mix for my coffee every morning. Cheers! wow those stats look awesome (you rarely see protein powder w/ that amount of fiber!) & that smoothie looks delicious! i’ll definitely keep my eye out for that stuff! never heard of big Train before. i’m sure i’ll see it all the time now-or at least notice it. coffee-99% of the time i like it hot. I think there were some Big Train products available in Great Falls if I remember correctly!! And if so…they were AAAAmazing!!! I hope this product IS released to the public — sounds awesome! Previous post: Double Chocolate Chunk Granola? There’s an Enjoy Life Foods review for that.